If you are familiar with my blog or books, you know I hold the opinion that binge eating is not a coping mechanism for underlying emotions or life’s problems. Instead, I believe binge eating is about coping with the urges to binge. In the Brain over Binge approach, the urges to binge are the one and only direct cause of binge eating; and even though an indirect link can develop between binge eating and negative emotions, there is nothing inherent about those emotions that make you binge. Furthermore, binge urges can and do arise under any emotional climate in the body, even during times of happiness or calm. However, some people have told me they can’t let go of the idea that their binge eating is an attempt to cope with feelings or problems in their lives. Although I still maintain that this idea can make the urges much more meaningful and compelling than they actually are, and recovery more complicated than it needs to be, I understand why it is hard for some to let go of this belief. The idea that you binge to cope may be longstanding for you; it may be something you’ve built your identity around in some ways. It could be that, through years of believing that binge eating was your coping mechanism (regardless of where you acquired that belief), you haven’t even tried healthy forms of coping in a very long time. It may be difficult for you to see the urges as just faulty signals from the lower brain, because to you, it feels like the urges are signaling something emotionally meaningful. It may feel as if the urges are pointing you toward something you need: a way to avoid your feelings or cope with problems. If this is the case for you, you may believe that the only way to stop binge eating is to learn to manage or solve your difficult feelings and problems, and implement healthier coping behaviors. You may feel like, if you did that, you would no longer want to binge. (This is the approach reflected in mainstream theories and therapies for eating disorders). 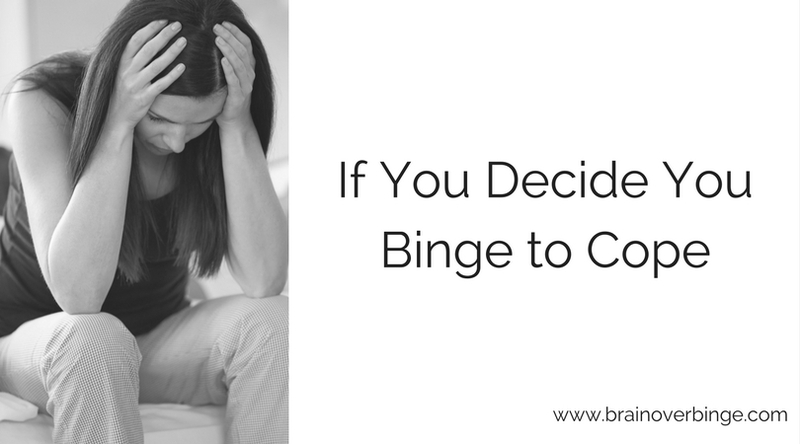 If you decide you binge to cope, you may be wondering if the Brain over Binge approach would be useful for you, or if it’s incompatible? If you feel that healthier coping behaviors are what you need, it’s likely that the urges to binge are preventing you from learning and using those behaviors. When you have a binge eating habit, and therefore have urges to binge, no alternate behavior (including coping behaviors) will feel as compelling as binge eating. When your thoughts are only fixated on getting large amounts of food, the idea of doing anything else, including anything that would help you cope, is going to seem unappealing. Your brain simply isn’t driving you toward a healthy coping behavior, it’s driving you to food. Even if an alternative coping strategy would help you deal with the emotions you are experiencing, getting yourself to do it in spite of the urge to binge, can seem like a monumental task. So, how do you get yourself to actually do the coping behavior you think will truly help you? You first need to dismiss the urge to binge. Dismissing the binge urge means to stop giving it value and attention, and to see the urge as not what your true self actually wants. Even if you believe that binge eating is a coping mechanism, it doesn’t change the fact that you (in your higher brain) don’t actually want this coping mechanism. You don’t want to binge to cope. The urge to binge is still a faulty lower brain message, not worthy of your consideration; and you have to dismiss it in order to learn to cope. If binge eating felt like an effective strategy for coping and it was helping in your life, then there would not be a problem for you. But that’s not the case. You are here trying to recover, and that means binge eating is creating pain in your life that you want to get rid of. Even if you feel like it has a strong connection to emotions and helps you temporarily avoid certain feelings or problems, those ‘benefits’ simply don’t feel worth it to you. You may find yourself thinking that you can’t stop binge eating until you find healthy ways to cope, but I challenge you to start considering that you can’t find healthy ways to cope until you stop binge eating. You can’t implement any healthy coping behaviors until you learn to dismiss binge urges. For example, if you can dismiss the urge to binge in a moment of stress, you are then free to use any coping behavior you want to deal with the actual stress–a behavior that will not cause harm to your body and mind and that will not create even more stress in your life, like binge eating does. Regardless of when, why, or how the binge urge arises, it is still neurological junk, it is still a harmful message that your true self doesn’t actually want to follow. You, in your higher brain, want to choose to do other things in your life that are in line with who you are and who you want to to be. Dismissing binge urges gives you the capacity to do those other things–whether those are healthy coping behaviors or anything else you want. *If you are unfamiliar with the concept of dismissing urges, I’ve written a free eBook to help you understand and learn this approach. You can get that free eBook (“The Brain over Binge Basics”) by clicking HERE.